Upholstered in a sumptuously soft strand caramel, the Sienna chair will make a beautiful accent chair in any living room, or any number of rooms throughout the house. With sharp “L” shaped arms, the Sienna chair radiates sophistication, and will work well alongside a wide variety of furniture styles from classic to contemporary and bring out the best in your decor and existing furniture. The strand caramel fabric gives the Sienna a unique look that will offer your home a subtle statement and as the fabric has a variety of muted shades it will work well in more or less any colour scheme. The legs have a tasteful dark colour with arched stands which provide more support on the Sienna chair. The design of the chair reinforces the elegant shape of the chair and keeps all the cushions looking plump and full. 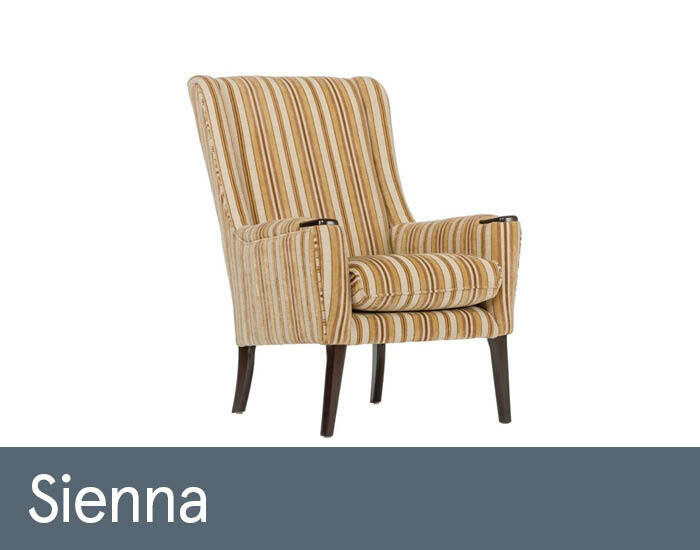 The Sienna chair is certain to make a beautiful statement in your home and lift the decor of any room.